Author: Gian Claudio Batic. Series edited by: Dymitr Ibriszimow, Henry Tourneux, H. Ekkehard Wolff. 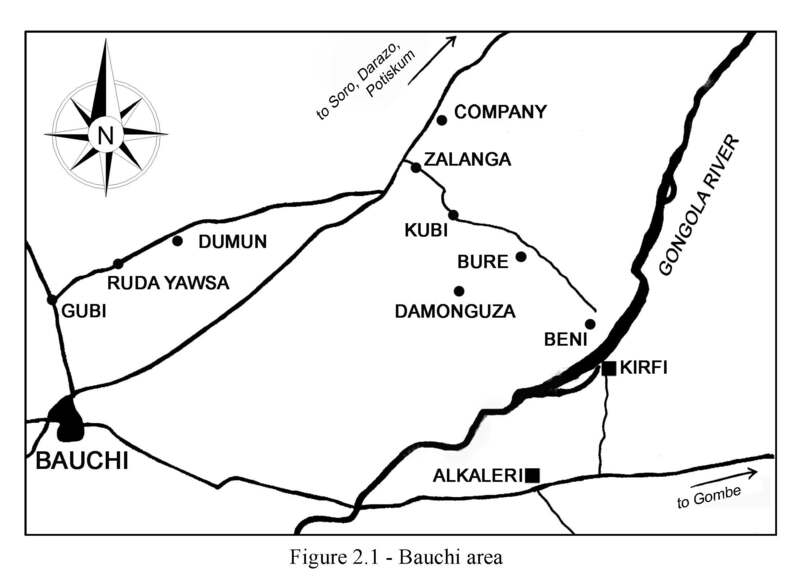 Bure is a West Chadic language spoken in the village of Bure (Kirfi Local Government Area) in Bauchi State, Nigeria and in small settle­ments nearby. As consequence of the pressure exerted by Hausa, the number of Bure speakers have been decreasing dramatically over the last few decades. Out of a population of about 500 souls, today the speakers of Bure number less than 50. Bure is a critically endangered language on the verge of extinction: the language and the few elders, belonging to the great-grand-parental generation, who can still speak it will pass away together. The group is not represented in media, nor is the language, and Bure is seldom used in everyday linguistic exchange even by its few speakers. 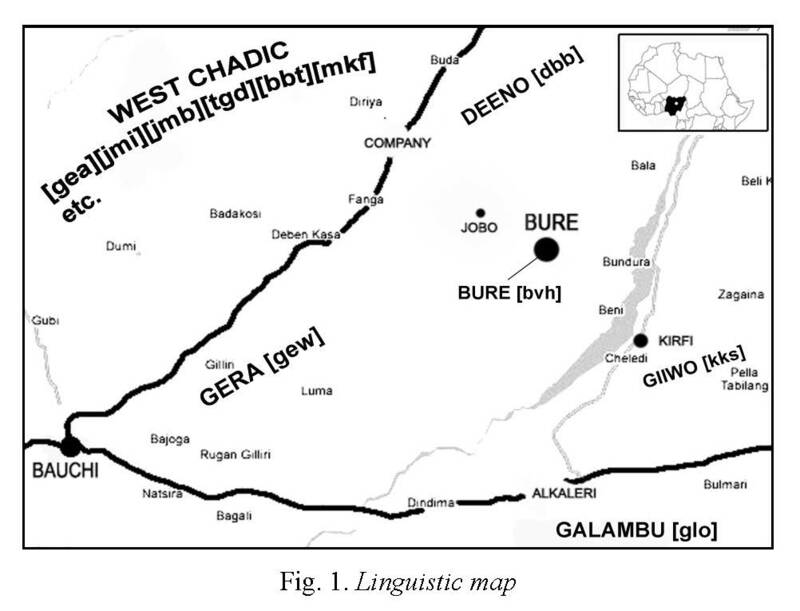 Identified as a Bole-Tangale language belonging to the Bole sub-group by Rudolf Leger during a survey of the Gongola river area in the 1980s, Bure shares many grammatical and lexical features with the neighbour languages Kirfi and Deno. The language is largely undocumented, and no overall grammatical description has ever been produced. This book aims at providing a socio-linguistic and grammatical sketch of Bure and is meant to be the first comprehensive approach of the language. The description covers the following grammatical aspects: phonology, nominal morphology, pronominal system, verbal system, syntax, and semantic themes. The descriptive section is preceded by a sociolinguistic profile of the language. The sketch also includes two texts with interlinear analysis and a Bure-Hausa-English vocabulary. Following the link below, you will find the complete text of a review by Nina Pawlak. 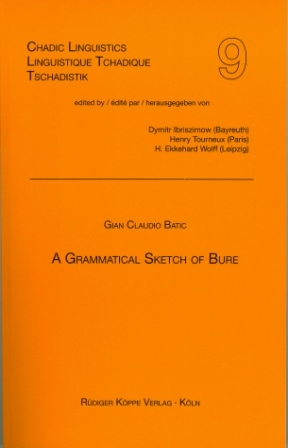 A Grammatical Sketch of Bure is a significant contribution in the description of Chadic languages from both the linguistic and sociolinguistic aspects. It brings new insights to the current investigation on Bole-Tangale languages and West Chadic from a broader perspective. First of all, the description of Bure provides new data for areal studies. Bure has many features of a contact language that are relevant for studies on the stages of language development and language reconstruction. [...] This work is an attempt at language revitalization and provides support for initiatives which aim to protect small cultures living in contact with dominant cultures. [...] Bure is a critically endangered language on the verge of extinction: the language and the few elders who can still speak it will pass away together. [...] The language is largely undocumented, and no overall grammatival description has ever been produced. For this reason we should be very grateful to this researcher for having given a so important testimony of this language, which in a short time will be compeletely disappeared. This book offers a comprehensive overview of the language; nevertheless the author had a really small material to examine, considering a very short number of speakers to interview.